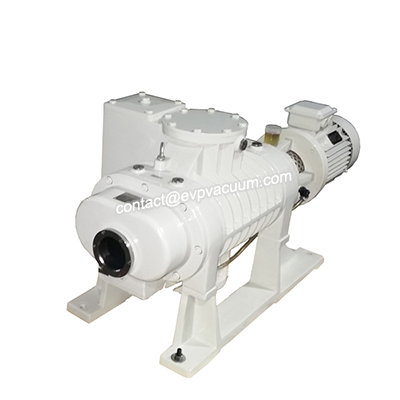 vacuum pump in vacuum filtration- Vacuum Pump - EVP Vacuum Solution! The so-called filtration is to make the pressure difference between the two sides of the filter cloth and other porous media, by which the solid particles in the filter slurry are intercepted, thus separating the liquid and solid phases. Vacuum filtration is carried out by using the pressure difference between the vacuum source on one side of the filter medium and the atmospheric pressure on the other side of the filter pulp (usually 4.9*104Pa-6.68*104Pa). The mechanism of vacuum filtration mostly belongs to cake filtration, and some belongs to deep filtration. Vacuum filters and other accessories are used for vacuum filtration. Vacuum filters can be divided into two types: continuous type and clearance type. Affiliated devices include: washing in order to reduce the soluble salt in filter cake; filter cake drying device, the purpose is to reduce the moisture content of uncompressed filter cake; vacuum pumps, vacuum pumps mostly use liquid ring vacuum pump and Roots vacuum pump, steam jet pump can also be used as a vacuum source; absorption tower, if the air of suction vacuum pump contains corrosive or toxic gases, then use filling. Material towers, plate towers, etc. absorb them, in addition to smoke separators, blowers and compressors. The common characteristics of this kind of filter are that the rotary drum leaching rotates in the filter groove, and the outer surface of the rotary drum has a filter medium, which can be continuously filtered. The circumference of the drum is divided into several filter chambers, which are connected with the distribution head mounted on the main shaft of the drum through respective pipelines. The distribution head is connected with the vacuum source and the compressed air source, so that each filter chamber can be connected with the vacuum source or the compressed air source in the process of rotation. By rotating the drum, each filter chamber continuously realizes filtering, washing, drying and discharging cake. In order to prevent the settling of solid particles, a stirring device is arranged on the filter. According to the different ways of cake peeling and discharging, drum vacuum filter can be divided into the following types. When the drum rotates to the unloading area, compressed air is sent to the area due to the function of the distribution head. Under the back blowing of compressed air, the cake is peeled off the filter cloth and scraped off by a scraper. Air backblowing also helps prevent cloth clogging. The machine is not suitable for discharging viscous filter cake. It is not suitable for filters whose concentration and particle size distribution can not keep constant and whose settling property is fast. In addition, the filter cake has good ventilation, easy to fall off from the drum surface, and it is not suitable to use this machine. Because the filter cake is discharged with a scraper, at least 6mm-10mm thick filter cake should be formed on the filter surface. It is inconvenient to change the filter cloth because the filter cloth is tied to the drum with metal wire in order to prevent the bulge when blowing back. Because the air piping and the filter piping are both used, the filtrate remaining in the piping will be blown onto the filter cake during the reverse blowing, thus increasing the wet content of the filter cake. The machine uses several endless ropes, which are wound at a certain interval on the partial filter surface of the drum and the guide roll. The suitable filter slurry is roughly the same as that of scraper discharge rotary drum vacuum filter. In addition, the viscous filter cake can be removed. It is not suitable for filters that are prone to clogging and cracking. Because the material is discharged by rope, the filter cake with a thickness of 1.6 mm can also be discharged. However, the filter cake thickness is better than 5 mm. The filter cloth is endlessly wound on part of the drum surface, the filter cloth guide roll and the tension roll. The filter cloth is driven by a drum, and the thin filter cake is carried away from the drum surface, and the filter cake is discharged at the turning point of the filter cloth. The discharged filter cloth is washed by the nozzles on both sides. There are also anti-deviation devices for filter cloth. This machine is suitable for filtering filters which are easy to clog. Because the filter cake is discharged at the turning point of the filter cloth, where the curvature of the rollers is larger, the filter cake with a thickness of 2 mm can also be discharged. Because the filter cloth is not fixed on the drum, it is easy to replace. When discharging cake, there is no backwash, so there is no problem of filter cake humidification. The disadvantage is that the washing water of the filter cloth needs to be treated before discharging, and a little filter slurry will leak from both ends of the filter cloth into the drum, affecting the orange clarity of the filter. Near the drum, a filter cake roll is installed, and its rotation direction is opposite to that of the drum. When the filter cake on the surface of the drum touches the roll, it is taken up and scraped off by the scraper. Even a filter cake thinner than 1 mm can be removed. The machine is suitable for filtering slurry with dry cake and high filtration resistance. However, the filter cloth is easily blocked and the filter cake with a thickness of more than 5 mm is difficult to remove. Firstly, diatomite and other filter aids are prepared into slurry, and then filtered by a drum with a filter cloth. Then a pre-coating of filter aids, i.e. a filter medium, is formed on the filter cloth. Because the filter cake is formed on the pre-coated surface, the filter cake and a thin pre-coated layer are cut off with a thin scraper when discharging. Generally, the thickness of the pre-coating is 40mm-90mm. If the drum is cut 15-150 micron thick every turn, it can work continuously for half a day to one week. When the pre-coating is cut to a certain extent, it is necessary to re-form the pre-coating. With this machine, fairly clear filtrate can be obtained. It is suitable for filtering filters containing less than 1% solid disc, fine solid particles and colloid. Because the filter cake is discharged by mixing with the filter aid, the machine is not suitable for the occasion where the filter cake is needed.